Businesses fail all the time. Every day, in fact. But behind every failed business is a crushed dream, impoverished founder, or in the case of many small businesses a traumatised family. 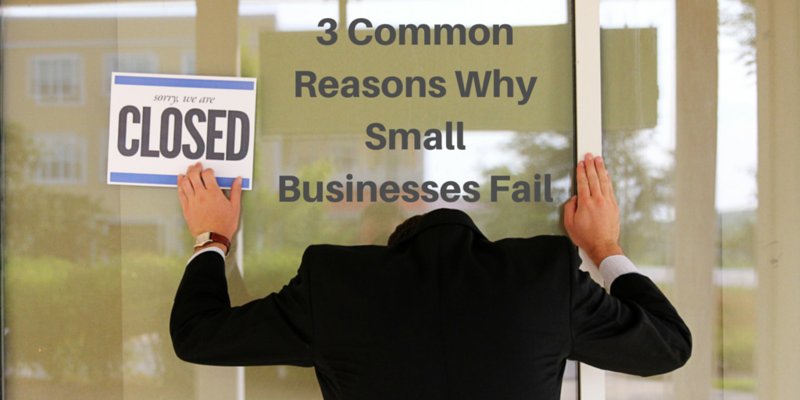 This post identifies three of the most common reasons for small business failure. Pay attention to these lessons and you could avoid becoming one of the statistics of failure. This ought to be simple. What do you do that’s different from everyone else? Don’t imagine that you are the only business doing what you do. So for clients to choose you over your competitors you need to give them strong, clear reasons why they need your particular approach. If you don’t convey that reason fast enough, they will walk right past you. Your unique selling point needs to convey why you are the best option. Also, consider this: is your product or service something which enough people would be willing to spend hard-earned money on? One of the most common traps that new businesses fall into is to undervalue what they do. Certainly, low prices will attract attention, but experience teaches that it’s likely to be the wrong kind of attention. It’s a rookie mistake to think that being significantly cheaper than your competitors will bring customers running. It is much more likely that clients are bound to wonder if your product or service is worse than your competition’s work. Potential clients will be too busy looking around for the catch, to see that you are in fact the best choice. If you’re cheap, they’ll look for a reason and if they don’t find one right away, they may invent one of their own. Quality is the one they most commonly settle for. So now they’ve pigeon-holed you as cheap rubbish. If you don’t value your product highly enough, why should they? Try to dig yourself out of that one. So now you’ve set up. You have got your company name, logo, website and stationery all set up. You have a neat row of freshly-sharpened pencils on your desk. Aggressively waiting for the phone to ring doesn’t actually have any effect. The number of small business start-ups that think clients will somehow discover them and order something, constantly amazes me. You have to get out there and rustle up some clients. That means marketing, but what marketing actually is, can vary from business to business. Sending someone out dressed as a chicken to dance in the street holding a sign might work for a fast food joint, but isn’t likely to attract clients to your legal firm. You have to find something creative yet appropriate to your industry and promote yourself using that. Set time aside each day for generating ideas to attract new business. Then spend time each day, putting those tactics into practice. Every day. When you are running a small business, you have to forget about the 9 to 5. Evenings and weekends don’t exist anymore for you. You can’t afford to wait for clients to find you, you have to go out with a club and fetch them in yourself. These aren’t the only reasons businesses fail, of course, but they are three of the most common ones. Take a good, clear look at your own small business. Are you making any of these mistakes? Make sure you are clear about how you are different and better than your competitors. Check your pricing structure and make sure you’re not selling yourself short. Most importantly, get up off your chair and start hustling. If that means making calls, pick up the phone; if it means getting a marketing mentor, get out there and find one. Remember, it’s never too late to make a change.